1 b&w; image taken at Manzanar, California concentration camp, 1942-1945. 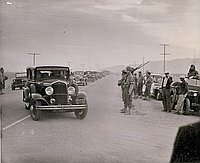 Exterior scene of a caravan of cars and trucks. Lead car is about to make a turn to a road on the R side of the image. Road disappears into the horizon, long line of cars stretch the entire distance. 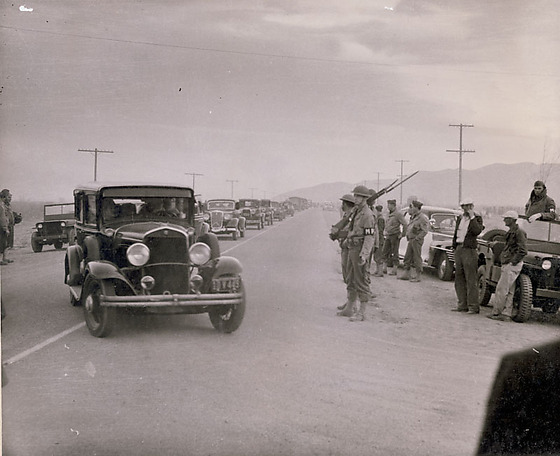 Along R side of road, are positioned armed U.S. military police, behind them are parked a police car and a jeep.